Yes. Time to cook up some fun here at The Scottie Chronicles. Let’s see….how about some veggie burgers? I like vegetables. Or maybe some GREEN BEAN CASSEROLE??? Fridays are fun days around my house. We have fun with fotos. Send me YOUR foto and We’ll have fun with it and post it here one Friday. Boy, have I got some new pics to share with you! From my furiends. So, sign up to follow The Scottie Chronicles if you haven’t already so you won’t miss any fun. Send me YOUR picture to StuartTheScottie@hotmail.com. 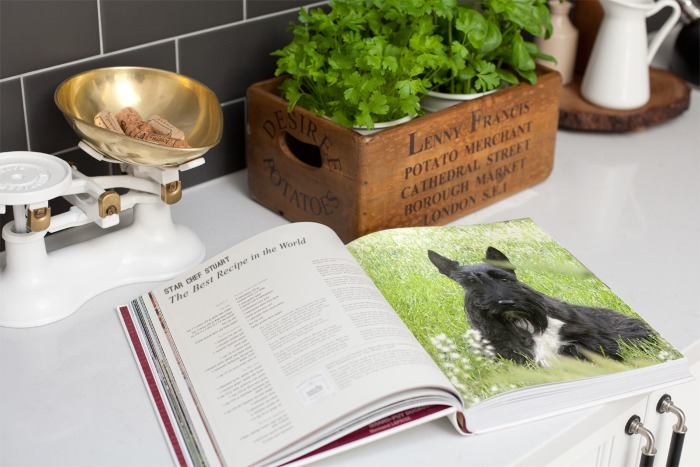 This entry was posted in The Scottie Chronicles and tagged books, Cooking, dogs, food, photography, Scotties. Bookmark the permalink. Somebody tell Lenny Francis that his potatoes are so old, they’ve sprouted. Shame on him. I’ll have some green bean casserole only if Lenny didn’t provide the beams. You don’t like green beans? That’s super. That means more for Stuart, Kaci, and me. We love us some green beans! OMD…. I didn’t know dat you were a chef! Cool. I’ll cook it up. Whatever you want! I help my Peep in the kitchen all the time. Whenever she’s cooking and drops something, I’m right there to clean it up for her! No paper towels needed! She calls me her ‘chow hound’. That makes TWO us chowhounds! Looks like you’ve been into the wine judging by the corks in the counter weight. We’d love you to cook us some haggis! We’re being silly today…..SHE is off on a golf outing, but could not take us even though our kind invented the game. HE is taking care of us and gives us more treats than SHE, but we do miss HER. FORE!!!!! Wait….did i hear right…Green Beans…..be right over! Y’all come right on over! We’ll scarf up some beans and make some more! I tried green beans before (when I was small) on your recomendation Stuart, but I didn’t like them, but, the peep was cooking and dropped one on the floor a few weeks ago. I snapped it up, and, well… It wasn’t too bad!